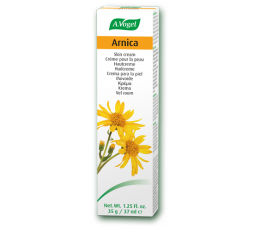 A.Vogel's silky, lightweight Arnica Skin Cream supports and cares for the skin. Suitable for use by the whole family, from active children and all those inevitable falls and bumps, to any knocks you've received throughout the day. Containing fresh extracts of Arnica flowers, Comfrey and Chamomile, A.Vogel's cosmetic Arnica skin cream is the perfect way to soothe skin! The Comfrey speeds up the healing process, while Chamomile has anti-inflammatory properties to soothe the bruised area. Arnica Skin Cream can be used for as long as it is needed. To use the cream apply a thin layer of cream onto the desired area and gently massage into the skin. It is suitable for vegetarians and can also be used during pregnancy. Only use Arnica on intact skin. Do not use Arnica Skin Cream on cuts, broken or irritated skin, or if you are allergic to arnica or any of the other ingredients in this product. Use within 5 months of opening. Aqua (water), Helianthus annuus (sunflower seed) oil, Arnica montana (Arnica) extract, Symphytum officinale (Comfrey) extract, PEG-8 Beeswax, Butyrospermum parkii (Shea) butter, Chamomilla recutita (Chamomile) extract, Alcohol, Cetearyl glucoside, Cetearyl alcohol, Parfum (fragrance), Limonene, Linalool.